I chose Bad Moon because yellow can see from afar in 6 mm. These are the first Orks I have painted and I have realised they are much more difficult to paint than plain Space Marines with their one colour armours. Anyway, with these boyz finished I'm ready to start my itEn solo campaign. Soon they'll see some action! This time 3 Warbands. With these I already have more than half of the DBA army, which I am very slowly painting due to the continuous "ooh shiny" interference. Ahora 3 bandas de guerra. Con estas ya tengo más de la mitad del ejército de DBA, que estoy pintando a paso de caracol por culpa de las continuas interrupciones de otros projectos. When I had them based, I realized I used too much blue in the shields, but I will fix it using other colours in the next three warbands. Cuando ya los tenía basados me dí cuenta de que había abusado del azul en los escudos, pero ya lo arreglaré usando otros colores en las tres siguientes bandas de guerra. A picture of all the elements together so far. 4 Ps and 3 Wb. Una foto de todos los elementos hasta ahora. 4 Ps and 3 Wb. Today it has been released the second edition of In the Emperor's Name, a free skirmish 40K rule set. The rules follow the KISS(Keep It Short & Simple) philosophy as in FUBAR, the other great free rule set by the same guys of Forge of War. 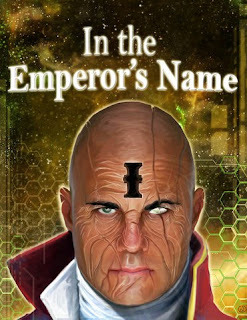 Epic retinues for In the Emperor's Name! I am finishing my retinues in 6 mm for the incoming release of the second edition of the 40K skirmish rules, In the Emperor's Name! Blood Angels with Librarian, Captain, Sergeant, Devastators, Tactical Marines and an ancient Dreadnought. Chaos Space Marines with a Dreadnought from the time of the Space Crusade. The Beastmen will probably proxy as Chaos Cultists. Squats retinue in the works, and after this one the Space Orks! 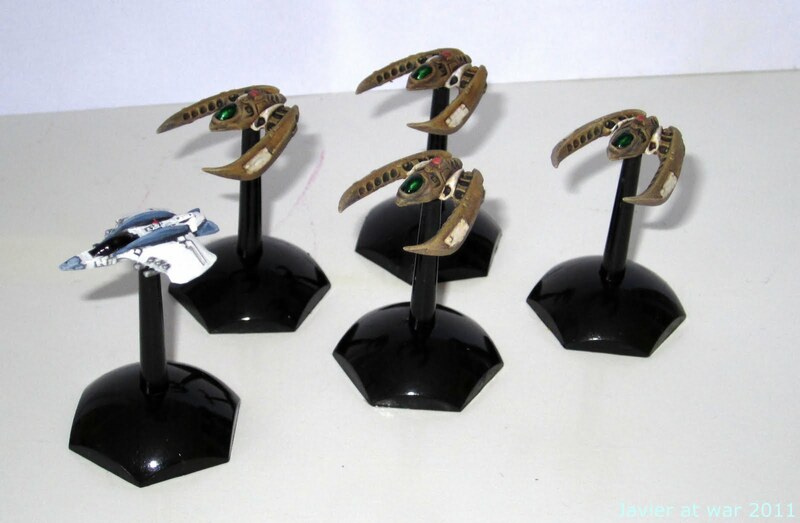 Now if I only can put my hands on a Genestealers sprue I'd be a very happy wargamer. If someone reading this has an spare Genestealer sprue and wants to sell it or change it for other Epic stuff, please contact me. Si alguien tiene una matriz de Robagenes de Epic, se la compraría o cambiaría por algo de Epic. Here is my latest batch of spaceships. 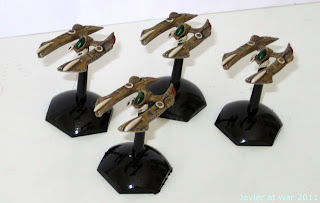 I do not know yet which ruleset I am going to use with them; actually I am tinkering with some ideas of my own, but the spaceships you can see below are going to be Killrathi no matter which ruleset I will be using! Without fortune - Arhem 1944, is a campaign booklet from Iron Ivan Games that my buddy and me started to play last Sunday in his house, using the ruleset Disposable Heroes for the first time. As we only have Germans and Americans, we are playing the scenarios as they are, but imagining it is Normandy instead of Arhem. The first scenario was Recon rescue, here the Allied forces had to recover important documents from a jeep destroyed in a crossroads. 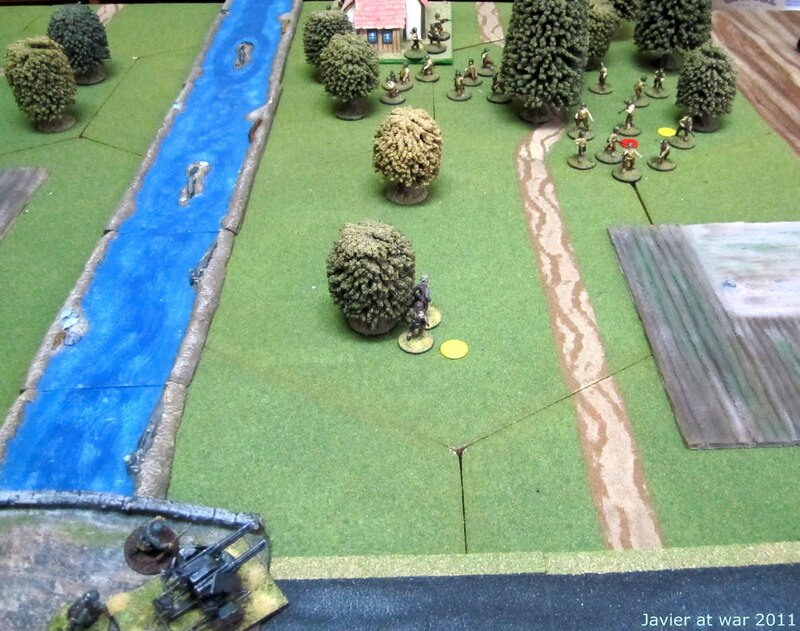 The Allied had three squads mounted on jeeps starting on the East, while the German forces deployed in the nearby forests 2 Panzer Grenadier sections, 1 platoon HQ and 1 sniper team, awaiting for them. The first two first jeeps entering the board, blazing Vickers. The Allied came straight ahead in their jeeps, firing their HMG Vickers and killing many German soldiers, but then the Germans fired back. In the end there was a massacre. The British got 0 battle and mission victory points whereas the German only got 3 mission objective points. On the German side only survived one gunner and the sniper, on the British side none. 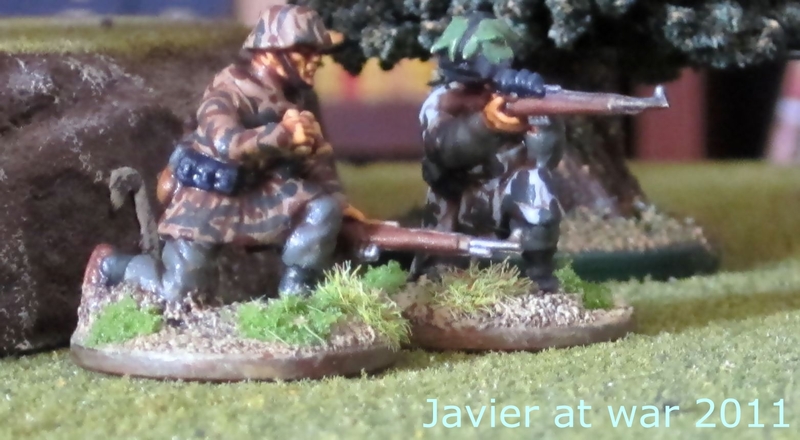 The German sniper team hidden in a forest. The game was very straight forward but it helped us to familiarize with the rules. After this, we hastily prepared the table for the second scenario, "A bridge too late", which we could finish in the same evening. 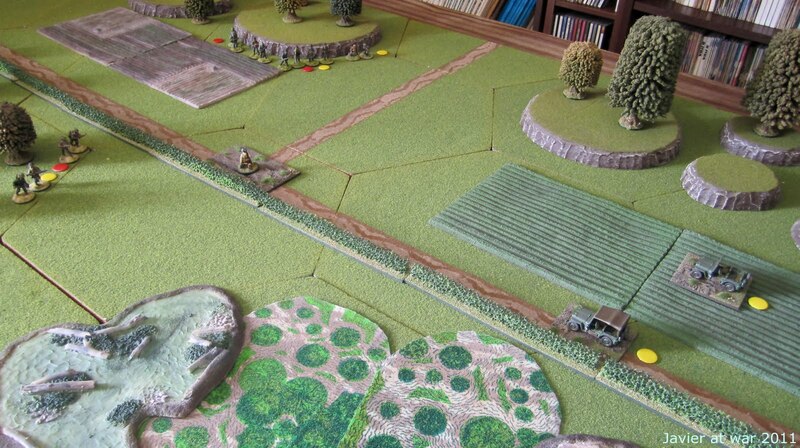 Paras coming out from the woods, surprising a German patrol in the road. 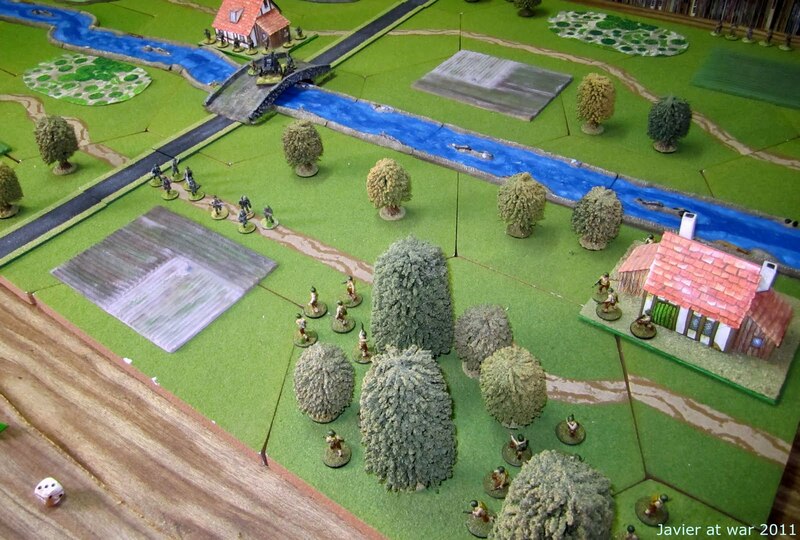 Here British parachutes with 1 platoon command, 2 Bren sections and 2 rifle sections, had to take a bridge and avoid the Germans blowing it up. The Germans had a Reichsdeutsche Conscripts garrison of 2 rifle sections, 1 recon squad and 1 2 cm Flak 30/38, plus a squad of Pioneers from the 10th SS division Frundsberg, who had already set the charges in the bridge. German Pioneers in the house and Flak on the bridge. The British gained the initiative in the first turn and managed to kill an entire German section on the road and wound the other who fortunately was not pinned and could move to a near forest from where they resisted several turns and delayed the Allied advance towards the bridge. 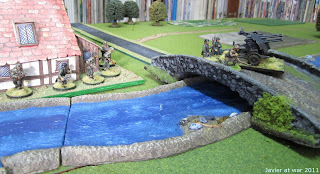 The German recon squad was wiped out in the open with Bren fire from the house, and the Flak in the bridge run away after taking some casualties. 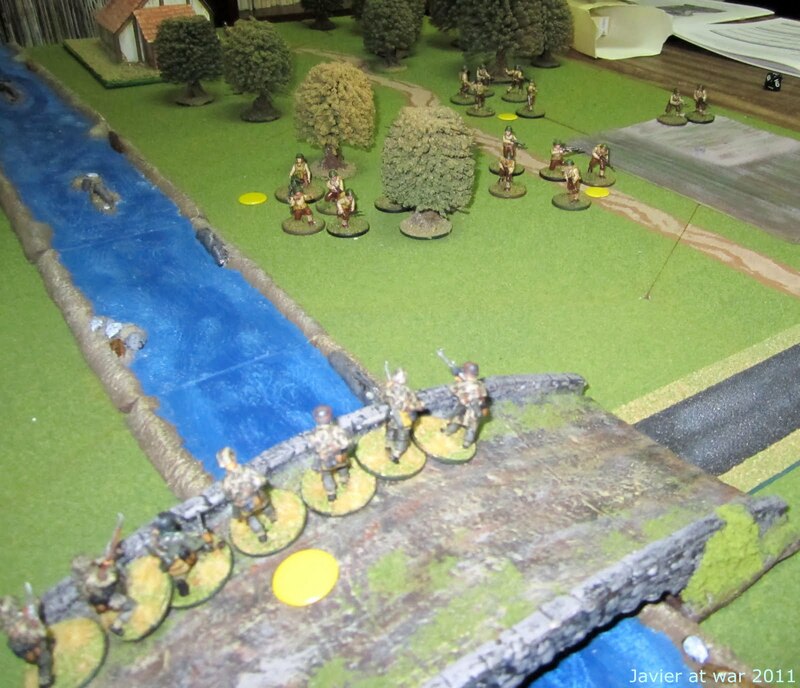 Then the Pioneers tried unsuccessfully to blow up the bridge and then were annihilated when defending the bridge. 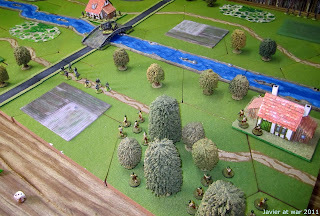 Although the British started very slowly and it seemed they would not take the bridge on time, they did it in the very last turn, destroying all German units in the process. So far Disposable Heroes looks a simple, fast and very bloody game, which it is not necessarily a bad thing. We will keep playing the whole campaign and I'm sure our opinion of the rules will be changing as we progress through it.